Heath had come to Milwaukee as a first baseman in 1937. In November of 1938, club president Henry Bendinger fired club skipper Alan Sothoron and made Heath a player/manager. Heath wore both caps for a year and a half until he too was relieved of his managerial duties partway through the 1940 season in favor of former Brewer Ray Schalk. Faced with the loss of his managerial cap, Heath chose to hang up his other one, leaving the team altogether on July 27th. 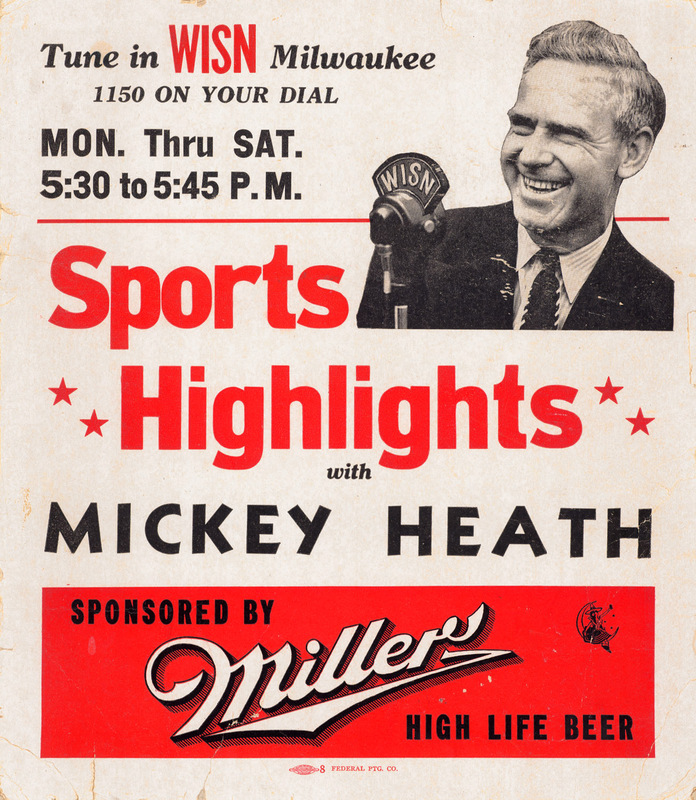 Heath continued to earn a living off the Brews, trading the Orchard's dugout for the broadcast booth as WISN's play-by-play man for the station's game broadcasts. 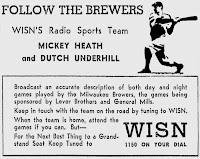 Heath had a real knack for radio, and continued his broadcasting even after new team president Bill Veeck hired him back as a part-time coach in 1942. When Veeck joined the Marine Corps in late November of 1943, Heath ascended to vice president and added team pitchman to his resume, keeping up his radio work all the while. 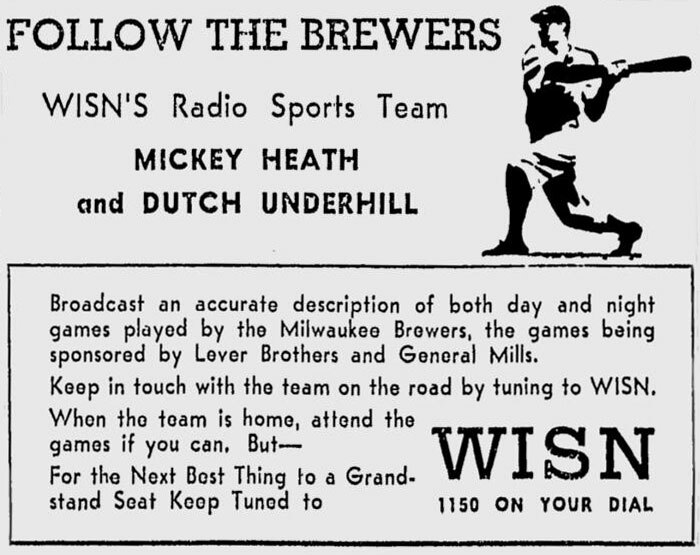 Before the 1944 opener, the Brewers announced that for the first time in eighteen seasons, live games would not be carried on the radio. 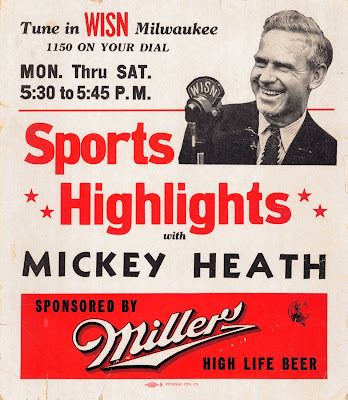 Fans of the Brews would have to content themselves with a 15-minute review of game reviews and highlights Mondays through Saturdays at 5:30 on WISN (courtesy of the Miller Brewing Company), and a half-hour review every night at ten thirty on WEMP (this time by Gimbels). In 1945, the late-afternoon review was cancelled and the evening review moved up to 10:00pm. On game days, Heath would join games already in progress and provide play-by-play through the last out. For all other games, WEMP provided score updates (sponsored again by Gimbels) every fifteen minutes. That dates this poster to the 1944 season. And what a season it was – Casey Stengel at the helm, a great team of players and the Brewers' fifth Association pennant (the middle season of a three-peat). Lots of highlights to fit into fifteen minutes, six times weekly. Have You Seen Our Pages?